Description - Who said watching movies wasn't fun anymore? They must not have had Joy Carpet Double Down carpet in their home theater or cinema. This fun and the whimsical inspired carpet is the perfect flooring option for both residential and commercial spaces. 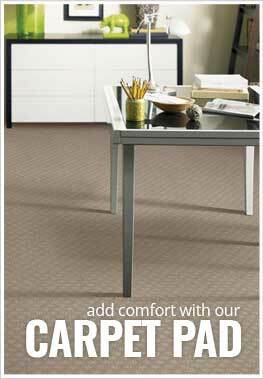 Resistant to staining, wearing, soiling and mold make this carpet super easy to clean and maintain. Featuring a Class 1 fire rating and a Green Label Plus Certification, this broadloom carpet is sure to be safe and eco-friendly and is backed by a lifetime warranty. Pattern Repeat - 36" x 18"
Recommended Uses - Joy Carpets Double Down carpet is the perfect flooring option for both commercial and residential use. This broadloom carpet is commonly found as flooring in cinemas, as basement flooring, in home theaters, as flooring in family rooms, as rec room flooring and much more. Stain, wear, mold and soil resistant. Great as flooring for home theaters and cinemas. We did a big update to our family / movie room to make it more fun for the kids. The carpet is holding up to the wear and tear of the kids playing, and so far against the typical movie spills. So far so good.